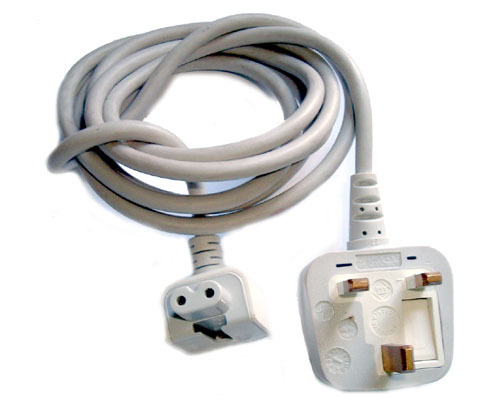 Original UK three pin Apple mains lead for white block power supply units/chargers used with MacBooks, MacBook Airs, MacBook Pros, white iBooks and aluminium PowerBook G4s. The modified figure of 8 connector forms one corner of the power supply block and completes it's shape when connected. This lead is NOT suitable for the silver plug versions (IB3PSU) of the 45w iBook/PowerBook adapter as this contain the traditional figure of 8 mains socket which will not accomodate this lead.